When it comes to investing in the stock market, we are really talking about buying shares in companies that are ultimately driven by profit. It’s often argued that profit and ethics don’t make a good match. Whilst exploitation and unfair practices in the name of profit undoubtedly take place, the motivation of profit itself is not always a bad thing and has led to the discovery and creation of many life-improving products that we take for granted. The Cambridge Dictionary defines Ethical as: 'relating to beliefs about what is morally right and wrong'. 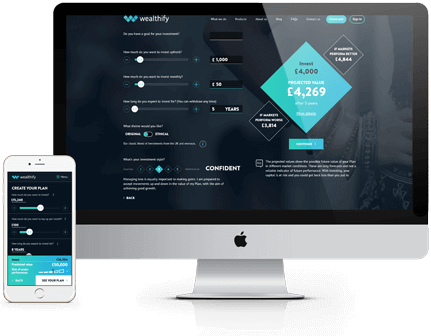 Using best-in-class ethical funds, Wealthify’s Ethical Plans aim to avoid investing in companies profiting from four main areas of activity: gambling, tobacco, adult entertainment and weapons. There’s no doubt these activities are capable of causing considerable harm and detriment to modern society, but they are by no means intended to represent the full spectrum of ‘unethical’ behaviours. We do not, for example (at present) offer portfolios that exclude alcohol or meat products, two things that arguably cause comparable harm to people and the environment as the others. The difficulty is that ‘ethical’ is subjective and everyone is different. To strive for full inclusivity and banish any company or activity incompatible with an individuals’ beliefs would be to severely limit an ethical portfolio’s investment options. Luckily, sector exclusion is only half of the story with ethical investing. The average ethical fund manager will spend significantly more of their time searching for and identifying ‘best-of-breed’ companies that demonstrate or are making significant strides towards more ethical behaviours in the form of their environmental, social or governance policies. They may even exercise shareholder voting power to steer the organisation towards ever higher and sustainable standards in the strategic direction of the organisation. For example, at Wealthify, we use different ‘thematic’ funds and one of them focuses on gender equality issues. Its fund managers actively seek out companies that score highly against a range of relevant measures like equal compensation, work-life balance, gender balance in leadership and parental leave policies. By investing in this fund, you’re supporting companies that are actively shaping their cultures and practices to drive permanent change. What’s more the fund managers leave plenty of space for continuous improvement, only modestly ranking even the best performers. A firm with highly-commendable and established equality practises, General Motors, for example only receives a “B+” at present. This approach ensures that the highest standards are maintained whilst rewarding companies that are making improvements and dangling the carrot of incentive to strive for better throughout industry. You’d think there are certain sectors, like oil and tobacco that are beyond ethical redemption no matter how much shareholder influence a fund manager can wield. But ethical investing can even help those companies whose activities seem incompatible with positive environmental or social change. Tobacco companies are accused of marketing to children and glamorising behaviour that can ultimately lead to death, despite the dangers having been known for close to a century. Yet tobacco giant Phillip Morris recently announced that it intends to go 100% smoke-free as soon as possible, a move applauded not just by health professionals, but shareholders too. Such a wholesale commitment to improvement and future-proofed business sustainability is precisely where an ethical fund manager might opt in, provided it’s compatible with the funds own criteria and independent verification processes. Whilst purely theoretical, justification for the investment would likely be both on the basis that it’s easier to shape change from within, and that ultimately doing so will drive shareholder value and help to significantly and permanently reduce the negative impact of a company that has long contributed to the degradation of public health. This discussion is not about performance, which research shows is not significantly different between Ethical and Original investment approaches. This is about individual choice. Recent times have seen an intensification of concern about corporate behaviour, coinciding with a positive spiral in the level of corporate transparency. Greater availability of information via regulatory requirements and social media and technology-assisted improvements to the accessibility of investing have also contributed to growing consumer demand for ethical investing solutions. Investors now have the tools and the means to identify and invest in those corporations whose values most closely align with their own. Ethics should not be seen as a battle between good and evil, as it so often is in the movies and literature, but the journey and the destination. Ultimately, the individual nature of ethics means you must reflect on what is truly important to you, based on your values and whether or not they are compatible with the inner workings of companies and global financial markets. Shareholders are ultimately driven by profit, but by placing more value in sustainable practises through the choices we make as investors and consumers is surely a constructive and progressive step.